Linda Colors by New Look ~ Need some color in your life? Instead of risking your own hair with coloring and dyes, make it easy on yourself with the Linda Colors wig by New Look. Full of color and natural shine, the long layers of hair come down and bring beauty out in any woman willing to give this wig a chance. A full simulated skin top allows you to part the hair in any direction you’d like, and still retain the realistic effects you’ve come to expect. Never have any problems convincing people that this is your real hair. Our Linda Color wigs have always been a top seller, and continue to provide women with the look they love to own. Comfort and style is combined to ensure that you remain entirely comfortable throughout your time wearing the wig. 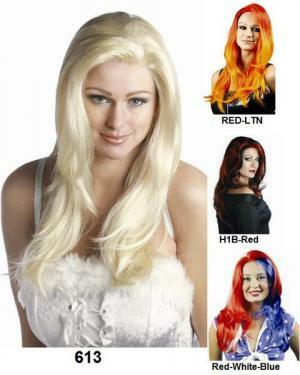 At our low price, you can enjoy your own Linda Colors wig today. Simply select your color, and add to cart. It’s so very easy.